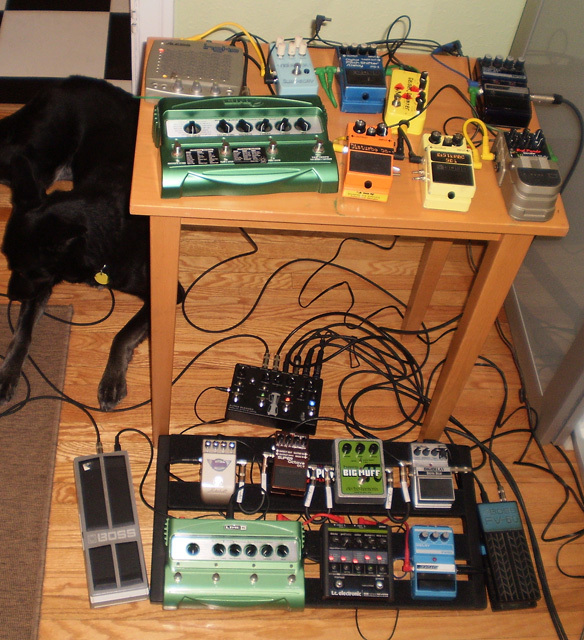 Today’s pedal line is from Ted Harms. If you have a pedal line (doesn’t have to be in a board) for your rig, please email me a photo, bio, description of pedals and routing to pedalline@nulleffectsbay.com. Every Friday I’ll showcase a pedal line submission. Make sure you include any links to your band or music page. I’m a double bassist and lead the VOC Silent Film Harmonic, an ensemble that accompanies silent films with improvised soundtracks; I also just make noise for my own enjoyment. Penny the dog provides inspiration. Digitech Digidelay – left on the short loop setting. I’ll run it, turn the other effects on/off while having the DL4 on. When the DL4 is full, then I’ll cycle through the DL4’s half-speed/double-speed/reverse settings to provide extra ambiance. Electro-Harmonix Big Bass Muff – nothing like it to add some fur; can get wooly when I’m really leaning on my bow. Boss OC-3 Super Octave – in the poly setting, and especially with the Muff, can make a nice wide sound bass of doom. DOD FX90 Delay – all controls dimed. Can’t leave it on for too long otherwise it overloads but a nice atmospheric swell as it ramps up. TC Electronics Nova Reverb – set on plate for a big sound. Gives a great effect when I hit my bass. Might be replaced as I’m having my Alesis Nanoverb rehoused in a floor pedal. Line 6 DL4 – left on loop setting. DOD DFX9 Delay – commonly used in the short loop setting and then subsequent pedals turned on/off, much like the Digitech on the floor. Red Panda Labs bitcrusher – a wonderful bit of freaky goodness dropped in a Line 6 Tonecore pedal. Many, many sweet spots on this pedal. DAED-modded Boss SD-1 & DAED-modded DS-1: no modding to original circuits. Modding by the freaks at Disagreeable Audio Experience Designs introduces mega-heavy fuzz, mini-theremin, high-pass filter, etc.through the swithces. The SD-1 has a power-choke for extra square-wave/bit-starved wonder. WMD Geiger Counter Civilian Issue – love scrolling through the effects (in low-fi mode, of course) while the DFX-9 loops. Boss PS-2 Digital Delay/Pitch-Shifter – glitchy goodness when running through the mode knob. Using the octave down, when it’s already getting a low signal, makes it glitch nicely. Subdecay Noisebox – should’ve have been called Rice Krispy as it adds lovely snaps, crackles, and pops! Alesis Ineko – a very handy and tweakable multi-fx unit. Line 6 DL4 – as the floor unit, left on looping mode. Each effect chain runs through a volume pedal, to take the whole chain up and down, and then through a Wounded Paw Ultra Blender switcher.